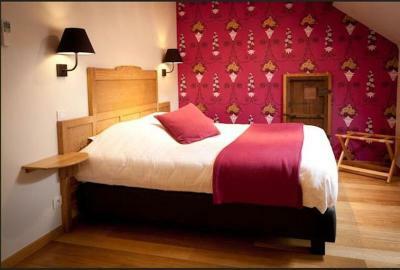 Lock in a great price for Hotel Le Saint Hadelin – rated 9.3 by recent guests! Great location and calm atmosphere. Lots of beautiful nature around and lots of opportunities to eat out! Within driving distance of many interesting locations and activities. The breakfast was good and had a great variety of options. The room was comfortable and had a lovely character. This is a wonderful hotel. I’m so glad I found it when I was searching for a hotel near Dinant. 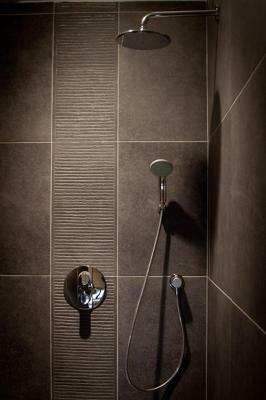 The rooms are well appointed and have very nice bathrooms. The breakfast has a good selection of meats and cheeses and each day they offer a different egg dish. The town is picture perfect and has an excellent bakery and two fantastic restaurants. We brought a dog and they even let him sit with us in the restaurant. The staff was wonderful And the owners,too The restaurant connected with the hotel is worth five stars! I would love to come here again. The rooms are quite comfortable and nicely decorated. The hotel is situated in a tiny town behind an impressive church so it is very quiet. There is ample parking. Breakfast is served in a cozy, charming room with generous and varied choices. Although it's a bit extra, the cost is modest and more than worth it. There are croissants, baguette, breads, fruit, yogurt, eggs, plentiful coffee and fresh squeezed orange juice as well as a selection of meats and cheese. Be sure to have dinner in the connected restaurant that is open on weekends only. We were there to attend the Ciney Antique market and it's the perfect location. Wonderful stay, as usual. The restaurant managed once more to exceed our expectations. Comfortable nicely decorated hotel in stunning village. Charming small hotel in a beuatiful small village. Room on 1st floor front side was great. Breakfast in the hotel with fresh orange juice, different sorts of bread, eggs,...everything you need. Restaurant 200m away from hotel an main street with excellent menu, service and charming interior. Enough parking spaces around the hotel. A wonderful, charming small hotel right next to an old church in a very small village surrounded by forest on all sides. Perfectly clean, nice and large room, but still felt cosy. Both the building and the room were really beautiful. The little town is perfect for people looking for a quiet getaway. The staff were really friendly, and breakfast was served with a smile for everyone. Real freshly squeezed orange juice for breakfast! Also breakfast included a full bread basket, and eggs and bacon, fruit,etc. Very good. Also a number of restaurants close to the hotel. Perfect stay! This boutique hotel offers elegant rooms in a traditional stone-built house from the 19th century, a 10 minute drive from Dinant. Hadelin features a peaceful garden with a terrace. 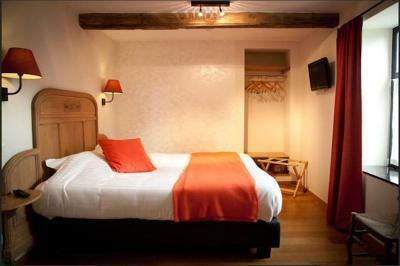 Each room at Hotel Le Saint Hadelin has a modern design with bright colors, hardwood floors and a flat-screen cable TV. Original features such as exposed stone walls give the rooms a unique feel. The area around the hotel is ideal for walking. Namur is 30 minutes away by car. Le Saint Hadelin is 30 miles from the center of La Roche-en-Ardennes. Local seasonal cuisine is served in the restaurant which is 300 feet from the hotel. Guests can enjoy dishes in a rustic setting. This property also has one of the top-rated locations in Celles! Guests are happier about it compared to other properties in the area. This property is also rated for the best value in Celles! Guests are getting more for their money when compared to other properties in this city. 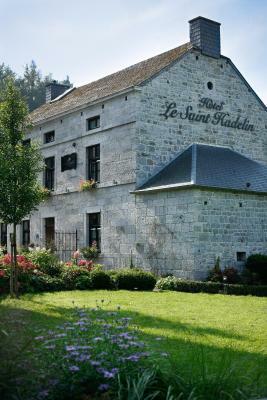 When would you like to stay at Hotel Le Saint Hadelin? A bright, second-floor room with garden views. This room includes a sitting area and views of the village. This room with bathtub overlooks the garden. House Rules Hotel Le Saint Hadelin takes special requests – add in the next step! Hotel Le Saint Hadelin accepts these cards and reserves the right to temporarily hold an amount prior to arrival. Please note that check-in takes place at the restaurant. It is located 350 feet from the hotel. If you would like to have dinner at the restaurant during your stay, please note this in the Special Request box during booking, or by contacting the hotel using the contact details found on the booking confirmation. Please inform Hotel Le Saint Hadelin of your expected arrival time in advance. You can use the Special Requests box when booking, or contact the property directly using the contact details in your confirmation. Sounds from the hallway and the stairs woke us up, but there was no noise from other rooms or outside. Restaurant is very busy in the autumn so staff is very busy. Hotel is about 100m from the restaurant. Just a small thing: a brighter spot/light in bathroom for the mirror would be great. As the steps and floor are in wood, you hear other guests coming in at night. An ideal country hotel and restaurant. All the staff were friendly and nothing was too much trouble. The room was comfortable and clean. The breakfasts were very special . The restaurant , although expensive and closed two days a week, served delicious food and well worth the prices. The village was pretty and surrounded by interesting places and countryside. Beautiful village and very nice hotel. The breakfast is delicious! Amazing location, such a beautiful place! Very nice room with authentic decoration. Wonderful restaurant.